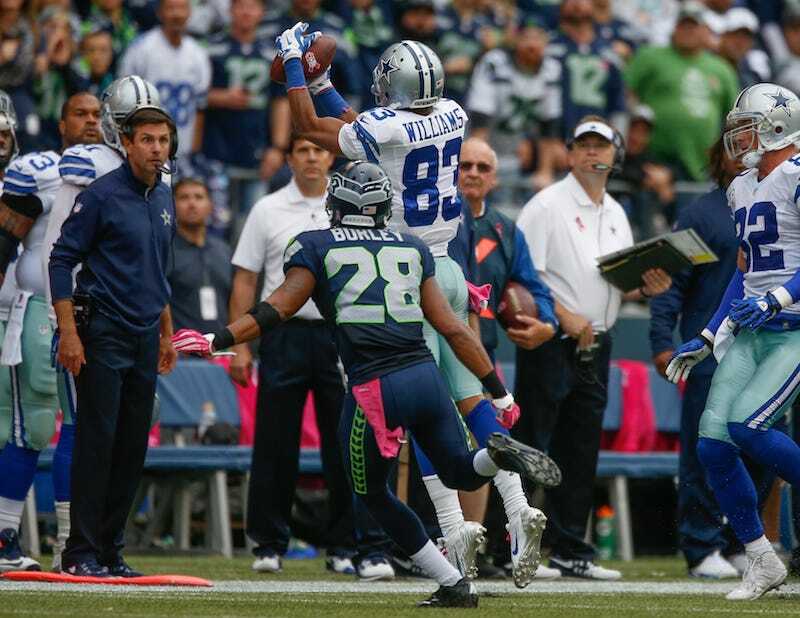 The best and most important play on Sunday was Tony Romo's hookup with Terrance Williams on a third-and-20, keeping alive a fourth-quarter drive that would end in the Cowboys' go-ahead touchdown against the Seahawks. There had been 55 third-and-at-least-20s to that point in the season, according to ESPN Stats & Info, and teams had converted a first down once. Romo and Williams made it twice. Williams's catch was beautiful. His double toe-drag was something you'd expect from the sophomore receiver; he'd showed it off at Baylor. But Romo's evasive maneuvers were the key. Let's break it down. Done. Williams gets his feet down on the pass intended for him—and not nearby tight end Jason Witten, according to Romo—and Dallas marches on. It was a very pretty play by Romo that led to a very big victory for the Cowboys, who are 5-1 and a lot of fun, all of which feel like strange words to type, and yet here we are.